Tiny Timmy: He’s never going to be the cat he was born to be. Tiny Timmy and Claudia Tietze are in the spotlight this week as she supports a lawsuit against harmful OTC flea products. 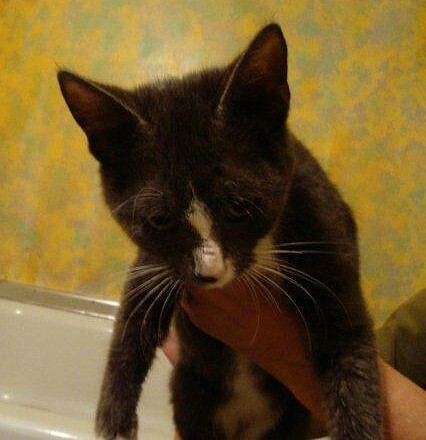 Timmy came to Claudia flea ridden, coated in chemicals, and with neurological problems. He has made great progress with diligent care. 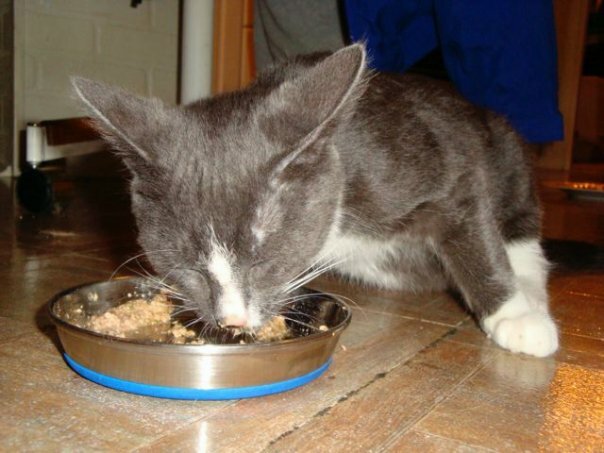 Tiny Timmy came into the life of Claudia Tietze in 2009 as a damaged kitten; flea riddled, poisoned by chemicals, and with neurological problems. Claudia devotes herself to Timmy’s care and rehabilitation, while waging a campaign against the flea products she blames for his neurological disorder. This week, Claudia and Timmy are in the spotlight over her backing of the principals in a lawsuit over harmful products and the damage they cause. I could not walk and could hardly stand. I mostly just laid around. 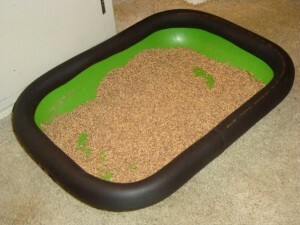 The peeps brought me a pet bed in my special room where I stayed for a while until I was strong enough to be around the other kitties. I couldn’t get into or out of the pet bed myself. I had severe tremors and muscle spasms. The peeps watched me all day and night to be sure I didn’t have a seizure. I was so weak I could hardly keep my head up by myself. If I tried, it would lull from side to side and I would just close my eyes cuz it made me dizzy. The peeps held me a lot and took me to see a vet who knew a lot about kitties like me. This is the first place I was fed kitty food. Before I got beer, cheetos, pizza, hot pockets and ice cream. The vet said my nerves were very damaged but that since I was so little, I might recover some. Nerves grow back at a really slow rate, but kitties grow up really fast. Some days are really hard for me because I grew faster than my nerves grew back. The vet said we should know how much damage I will have after about two years. That’s a long time for a kitty like me. I love noms… all kinds of food really. I used to peck at it like a chicken because I would tremor when I ate. I’ve gotten much better about that. I would wear a lot of noms on my face because of the pecking. It wasn’t all bad, though! It meant I got to have noms long after the bowl was empty! See how I am trying to balance myself? 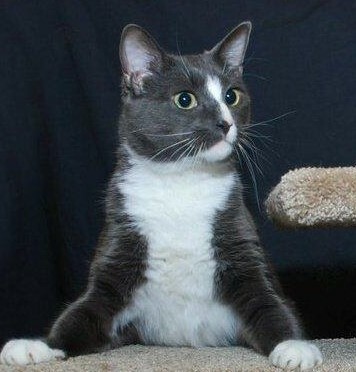 My front legs are way far back. I was still pecking at my foodies. It was like I knew what to do, but I just couldn’t make my body do it. Tiny Timmy’s personal journey continues from there, to include neurologists, acupuncture, improvements, setbacks and ordinary days. Timmy tries to be a normal cat and is given lots of love and diligent care. Timmy is also a spokescat for his petmom’s crusade to inform petlovers of the dangers of OTC (over the counter) flea and tick products. Claudia and a few of her colleagues have gone to Washington DC twice in the last two years to be heard by the EPA. The news video below features Claudia and Timmy, along with her message, and includes the most frequently used responses from the companies selling the products in question. Timmy you are so lucky that Claudia has you and I am sure that she would say she is to have you. I hope that you will live as good a life as possible and that all goes well from here on for you. Be strong and know that you are loved. So sorry about your begins Tiny Timmy. Hope you get better soon and able to be a regular cat and do all the things that regular cats do. You are an inspiration to all cats. Get well soon my friend and I love you alot also. My girl, Aby, was suffering from hyperthyroidism, but was on medication that would make her better. My vet assured me that my very ill 14 year old kitty baby could be treated with Advantage spot flea treatment for kittens. The day after I gave her the flea medicine, she went downhill FAST. She lost control of her bladder, was lethargic and cried in agony. While some of this may have been the hyperthyroidism, I think she was made even more sick by the flea med. Within three days after giving her the Advantage she was miserable, in pain, with no control over her bladder and had very little strength or life. I’m convinced that the Advantage helped to kill her. When I called Bayer, they insisted that they did not think it could be their medicine, but they did not know if it interacted with her thyroid or thyroid medicine. Even though my vet told me it should be okay for her if I gave her a kitten does, I’m positive there wasn’t enough knowledge about what illnesses and drug interactions would do.. I had to put my Aby to sleep three days after giving her the Advantage though it tore my heart out; I felt like I killed her. She was, I’m certain, affected by the Advantage. Be VERY careful with Advantage if your kitty is ill. I am now afraid to give my other cats Advantage, the Sargeants and Hartz had never worked to kill fleas, but they did at least give our money back (this was years ago) and it never caused illnesses at all as they did with Timmy. I am so glad that Timmy has a loving home, it makes all the difference in the world. Love him gently and unconditionally, he is a treasure. I will never forget my AbyNormal-who never suffered a sickness in her life. I know she could have beat the hyperthyroidism, but not the flea medicine. I’m so sorry for Aby’s suffering and demise, and for your continued suffering and regret. Remember the story of the kitty ,Tulip, who had swam to help with her nerve damage and she got to save her leg. Maybe Timmy could also swim and get some help with his nerve damage. Maybe you get this message to Timmy’s owner so he could get some more relief. I love that he has a loving owner. Thank you for posting this story. Thank you. I just want to know if that flea medicine, made by Bayer, contributed to her death. I love this site and am grateful for all the good that you do. I will always send out shares of your moving and sometimes horrific stories.